The John and Mable Ringling Legacy Society was created in honor and memory of John and Mable Ringling, whose 1936 estate gift created The John and Mable Ringling Museum of Art. 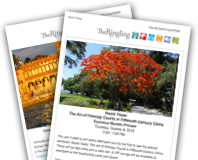 Membership in the Legacy Society is offered to all who have designated contributions to The John and Mable Ringling Museum of Art in their estate plans. The John and Mable Ringling Legacy Society is a tribute to the visionary Ringlings and to all generations of benefactors who embrace their vision and who share their ideals. Please contact us at 941-359-5821 to learn more about this special recognition society. The Charitable Gift Annuity is often referred to as the “gift that keeps on giving.” This popular deferred gift allows you to make a gift of cash or appreciated assets and receive a fixed amount of income in return. A Charitable Remainder Trust is a special type of income-producing gift arrangement. Charitable remainder trusts can be funded with cash, securities and, in some cases, illiquid assets such as real estate. To preserve your retirement assets after your lifetime, consider the benefits of using them in a completely different way. Life Insurance can be used several ways to make a substantial and meaningful gift to The John and Mable Ringling Museum of Art. A gift of real estate can prove both a practical and beneficial gift for you, your family and the Museum. It can provide you with an immediate tax deduction, a lifetime income for you and loved ones and long-term financial support for the Museum.